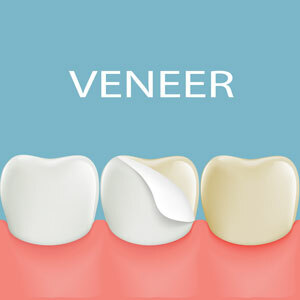 Veneers are a fast and convenient cosmetic solution when you want a comprehensive smile makeover. Each one is hand crafted to create a thin layer of porcelain that fits precisely over a specific tooth. When we pair them side by side one another, we’re able to transform your visible “smiling” teeth into ones that are whiter, straighter and properly aligned. Some people refer to veneers as “instant orthodontics” because of how effective they are. After the initial examination and planning appointment, veneers require two visits to complete. The first phase involves preparing your teeth and taking an impression of them, which we send to our lab to have the veneers created. We are able to specify the exact colour, shape and size of each tooth for a truly customised experience. At the second appointment, we try your veneers in, make any minor adjustments and then permanently bond them to the front of your teeth. We recommend caring for your veneers like you would your natural teeth, taking time to floss around them daily. Choosing to invest in dental veneers isn’t something that should be done light-heartedly. We recommend scheduling a consultation to learn more about the experience and if veneers are right for you. Flexible financing options are available. Contact us today to book a same-day evaluation; we’re open late!